With a magnificent beachfront location and modern, stylish aesthetic, this resort redefines all-inclusive luxury. Inspired by the rich character of Riviera Maya, suite accommodations incorporate indigenous materials, curated furniture and local artwork. Plush amenities include double hydro spa tubs, custom scents and an in-room mini-bar customized to guest preferences. A local host is available round the clock to attend to guests needs and offer an added level of personalized service. Five unique dining experiences vary from elevated fine cuisine to casual café settings, each offering locally-inspired menus. 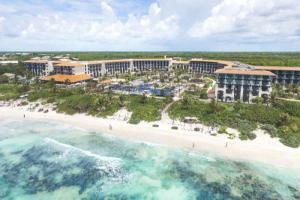 Located beachfront, five minutes from secluded cenotes and approximately 17 miles south of Cancun Airport.